This prophylactic serum helps to prevent aging by the use of a few different ingredients. Phloretin CF features a patented synergistic combination of 2% phloretin (it is derived from apples and the root bark of fruit trees including pear and grapefruit, it neutralizes damaging free radicals, helps improve cell turnover, and improves the appearance of discoloration), 10% l-ascorbic acid (known for its superior antioxidant benefits, this highly potent form of pure vitamin C neutralizes damaging free radicals and protects against oxidative stress while providing visible anti-aging benefits), and 0.5% ferulic acid (a plant-based antioxidant, it neutralizes free radicals and enhances the antioxidant benefits of phloretin and vitamins C and E) for enhanced protection against atmospheric skin aging, environmental damage and premature signs of aging caused by free radicals from UVA/UVB, infrared radiant (IRA) and ozone pollution (O3). 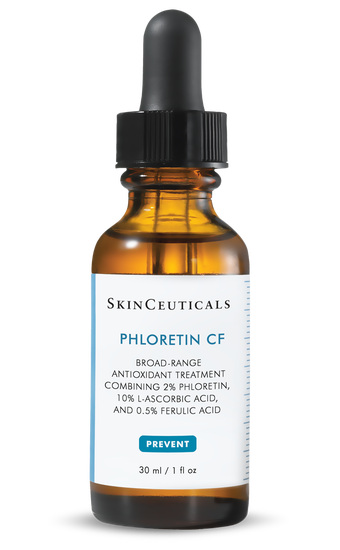 In addition to antioxdiant protective benefits, Phloretin CF improves the appearance of discoloration, fine lines and uneven skin tone. It provides advanced enviornmental protection by neutralizing damaging free radicals. It improves the appearance of discoloration and overall skin tone. Once absorbed, this Vitamin c serum remains effective for a minimum of 72 hours. It is paraben-free, fragrance-free- and dye-free. This serum is ideal for normal, oily and combination skin types. SkinCeutical's reserach shows that specific combinations of antioxidants, when effectively formulated, provide superior resuts to each single antioxidant alone. Phloretin CF is a triple antioxiant cocktail formulation shown to provide powerful environmental protection due to a synergistic combinaton of 2% phloretin, 10% pure Vitamin C, and 0.5% ferulic acid. It is formulated under the Duke Antioxidant Patent. Vitamin C is a highly-potent antioxidant that by its structure has difficultly being effectively absorbed on skin. The Duke Antioxidant patent describes the formulation parameters required for effective delivery of Vitamin C to skin: 1) pure l-ascorbic acid (vitamin C); 2) an acidic pH within the 2.0-3.5 pH range and; 3) a concentration between 10%-20%. SkinCeuticals is the only brand to formulate antioxidants according to these parameters. SkinCeuticals defines atmospheric skin aging as the visible result of a range of environmental aggressors on skin, including UV, infrared radiation (IRA), and pollution. Ongoing SkinCeuticals research shows that over-exposure to these aggressors may cause visible skin aging, and topical antioxidants can help prevent the impact to skin. In the morning after cleansing and toning, apply 4-5 drops to a dry face, neck, and chest before other skincare products. May be used on the back of the hands. It is normal for vitamin C products to darken after opening due to air and light exposure. The formula will remain effective. Once opened, it is recommended to be used within 3 months of opening. Complete your regimen with a SkinCeuticals sunscreen. When used together, SkinCeuticals antioxidants and broad spectrum sunscreens provide the most complete protection against visible aging caused by environmental aggressors. For me, I used it in the morning under my sunscreen. I thought that would be most advantageous than using it in the evening, when I already had many serums to apply. I used it for 6 weeks. I did miss a few days when I had a kidney infection and was in the hospital. But otherwise I got right back on it and still managed to see results. I saw fading of hyperpigmentation, fading of uneven skin tone and the great thing about this serum is that is can also be used a little under the eyes, so it helps knock back eye circles too. With this product it is going to do anything a Vitamin C product will do only better. It will help wrinkles, fine lines, hyperpigmentation, crow's feet, etc. I did experience a lightening of all of my facial skin. Lately my facial skin is in it's best condition ever. Skinceuticals Phloretin CF Broad-Range Anti-Oxidant Treatment Combining 2% Phloretin,10% L-Ascorbic Acid, % and 0.5% Ferulic Acid retails for $165.00 and can be purchased online at www.skinceuticals.com, www.skinstore.com, www.dermstore.com, www.bluemercury.com, www.skincarerx.com, and www.amazon.com as well as many physicians offices that specialize in SkinCeuticals and boutiques that carry the line too. Go to www.skinceuticals.com for more skincare information or ask myself at mariepapachatzis@gmail.com if you have questions about what skin type you fall into or have more info on skincare. I'd be happy to help. Like Skinceuticals on Facebook:https://www.facebook.com/SkinCeuticals; Follow Skinceuticals on Twitter:@SkinCeuticals; Follow Skinceuticals on Pinterest:https://www.pinterest.com/skinceuticals/; Follow Skinceuticals on Instagram:https://www.instagram.com/skinceuticals/; Follow Skinceuticals on Google+:https://plus.google.com/+skinceuticals and Subscribe to Skinceuticals on YouTube:https://www.youtube.com/user/skinceuticals.